During the historical period, marble is used in building sculptures and architecture as it manifests elegance. If you want to achieve a luxurious look in your kitchen, then this is an ideal material for you. It is also heat-resistant and can be cost-effective, depending on what kind of marble you choose. Another popular choice for worktops is granite. Homeowners use this material not just on their kitchens, but also to match their bathroom cabinets and vanities. It is known to resist chipping or scratching. Most importantly, it is easy to clean. Granite’s beauty came from a naturally occurring composite of mica, quartz and feldspar. There is a wide selection of granite types available at different price levels. When it comes to versatility, slate is the material to choose. It works well in bathrooms, kitchens and wet bars. You can even use this alongside kitchen cabinets as a material for backsplashes. Aside from its divine appeal, slate’s non-porous feature makes it easier to maintain compared to other materials. Moreover, it is more affordable than granite and marble. The most affordable countertop material is laminate. Because it has a tough coating, they are able to withstand heat and scratching. It can suit any type of kitchen style from classic to contemporary. They come in different appearances and can even replicate the look of wood or expensive stone. 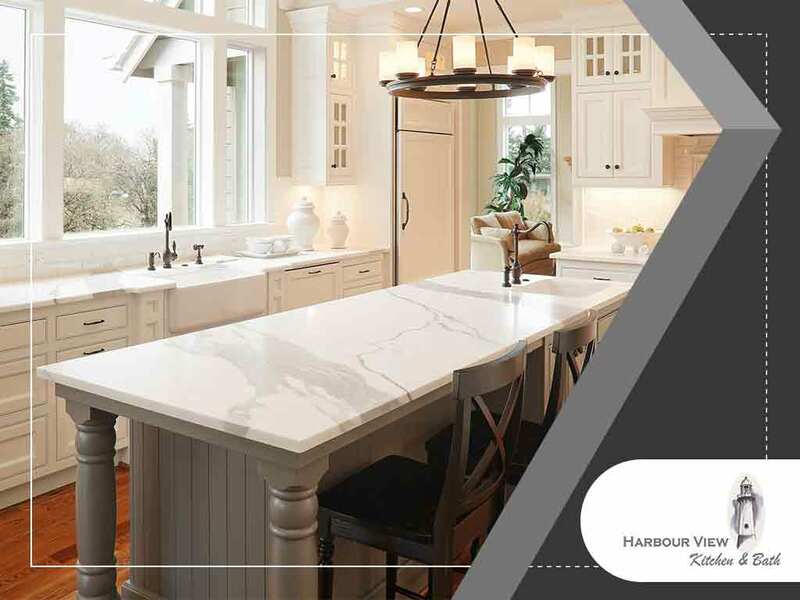 Harbour View Kitchen & Bath offers clients with countertops that come from major brands in the industry. We have a team who can guide you through which option of countertop you should choose. Trust us to apply our many years of experience so you can be assured to receive the right solution for your home. Call us at (757) 644-0848 today to start your countertop and kitchen cabinets project. Rest assured that our team will be with you in every step of the way. We proudly serve clients in Suffolk, VA and the surrounding communities in Virginia.